'll work with their partners to make it right, right away. And that's why this guarantee means that they look out for you from the very moment you book with Travelocity. Maximum cash back for Car Rentals is 1.5%. Cash back for Car Rentals is paid after picking up and returning the rental. Maximum cash back for Hotel or Vacation Packages is 2.25%. Maximum cash back for Airfare is $2 per order (not per ticket). Cash back for Cruise bookings is temporarily unavailable. Cash back is not available for Activities, travel for good products, rail, Last Minute Deals, insurance and gift cards. 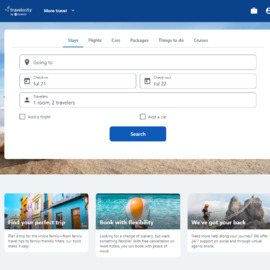 Additionally, travel booked through other advertisers on Travelocity.com such as Globus Vacations are not eligible for cash back. Click a Coupon or click Start Shopping to earn Up to 5% Cash Back at Travelocity.